The Super Critical Water-cooled Reactor is the successor of current boiling water reactor. The coolant circulates under high pressure (250 bar) and temperature (300 C) leading to a thermal efficiency much higher than nowadays’ reactors. Passive removal of decay heat is a challenge. Besides a thermal neutron spectrum, the SCWR can also employ a fast spectrum to better convert uranium to fissile plutonium. The use of thorium is beneficial but not optimal. The High Temperature Reactor contains coated fuel particles embedded in a graphite moderator. It is considered inherently safe as it can guide the decay heat of the fuel to the environment without any damage to the fuel. In the HTR, helium flows from top to bottom through the pebble bed to cool the fuel. Fuel pebbles are discharged at the bottom and, if not fully burnt, re-cycled at the top. Because of the good neutron economy, the HTR can utilize thorium much better than existing water-cooled nuclear reactors. Research in our section focuses on the interplay between the thermal-hydraulics and the neutronics in the reactor core, and on the usage of thorium in the pebble-bed HTR. The Molten Salt Reactor has its fuel dissolved in the coolant consisting of a liquid fluoride salt. The thermal MSR contains a large graphite reactor core with channels for the fuel salt. Only when the salt enters the core, the neutrons slow down and cause uranium to fission. Because of freeze valves - frozen salt plugs which will melt when the external power fails - the salt can flow freely to passively cooled emergency dump tanks in case of overheating. This safety feature together with the benign behaviour of the reactor to reactivity insertion, makes the reactor inherently safe. Due to the continuous processing of the salt, very few neutrons are captured in the core, leaving many of them available for breeding new fuel from thorium. With full usage of the thorium fuel cycle in the MSR, spent fuel would not be dangerous anymore after 500 years of storage. The molten salt reactor can also be run with a fast neutron spectrum. In this Molten Salt Fast Reactor (MSFR) the salt contains a higher amount of fissile nuclides and flows in a large vessel with no moderator and no coolant channels. The power production is intimately coupled to the salt flow in the core, which should be simulated using Computational Fluid Dynamics. Research on the MSR – both with a thermal neutron spectrum and with a fast neutron spectrum - focuses on the safety evaluation and fuel cycle performance and uses in-house developed codes for the evaluation of the power density, temperature distribution, salt flow, burn up, chemistry and other disciplines. The U-battery is a very small reactor based on the HTR concept with output of only 10 MW. It can be manufactured in series and is designed to power isolated communities, industries, islands, etc. The SLIMR is a small modular super critical water-cooled reactor with power of 200 MW. Its modularity makes it economical to produce and the fuels’ decay heat can be removed passively. Research on the nuclear fuel cycle focuses on the use of thorium in above-mentioned nuclear reactors. Thorium has no fissile isotope so a reactor should always be started with uranium from an external stockpile. Once started, the reactor should be able to sustain criticality and to breed its own fuel from thorium. 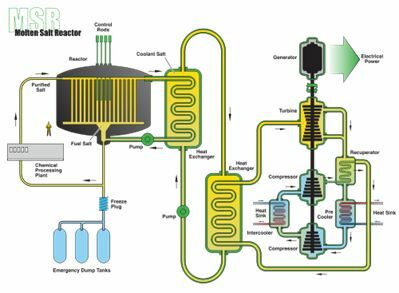 The HTR is the preferred reactor type for the short-term, although the thorium fuel cycle requires processing of the spent fuel, for which today not mature technology is available. 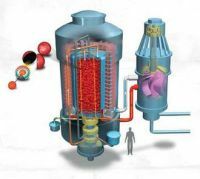 Fuel cycle studies aim to breed fuel in the HTR without compromising the inherent safety features of the reactor. 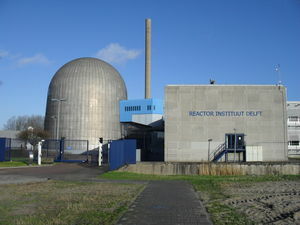 The second reactor type considered is the MSR, both with a thermal and fast neutron spectrum. Because of the good neutron economy of the MSR, partly due to the continuous processing of the fuel salt, breeding new fuel is more easily achieved, but requires complex chemical processing of the salt.